I was meant to make it at the knits sewing course back in June, but I didn’t even finish my simple T-shirt, never mind making a dress as well. But the course came with the pattern so I have had a plan to make an Autumn weight Coco ever since. Having used the original material to make the cowl neck suit, to which it was much better suited, I purchased some better quality ponte roma from Minerva fabrics, along with some plain black medium weight jersey for which I now have many more plans. I didn’t want my Coco to be too casual. I want to be able to wear it for work. In fact, compared to all of the many Coco pictures on the internet, it doesn’t even look much like a Coco. And it looks better on me than on the form. After some difficulties with sizing some of Tilly’s other patterns, I was a bit concerned about my adjustments to this one having graded it from a size 6 at the bust up to a 7 at the hips. Well it was ok. The other big difference was that I lengthened it by 8cm and did wonder whether that would be enough. It seems to be ok, although I haven’t worn it other than to try on yet. As a result of it being so much longer it loses some of its stand out A line, but gently folds to the hem instead. In my opinion this is better. It will probably look good with a belt too. A black medium weight jersey belt is one thought! I wanted to make as much as possible of my Coco on my overlocker, having recently changed all of the treads for black instead of the white pre-threaded. It was all so easy! The Coco sewing that is; not changing the overlocker threads. It took me less than 3 hours from starting to cut to completing it. I even sewed the sleeves with my overlocker. So quick and one of the few garments that I own with neatly finished sleeves. Wow! There’s not much more to say other than that I have plans for a jacket (another) that will compliment the dress, but be much harder to make, and I will make a Coco tunic at some point. Very stylish! I have recently made my first Coco too – but in a very casual whimsical helicopter fabric! Love yours though – gives me some new ideas! 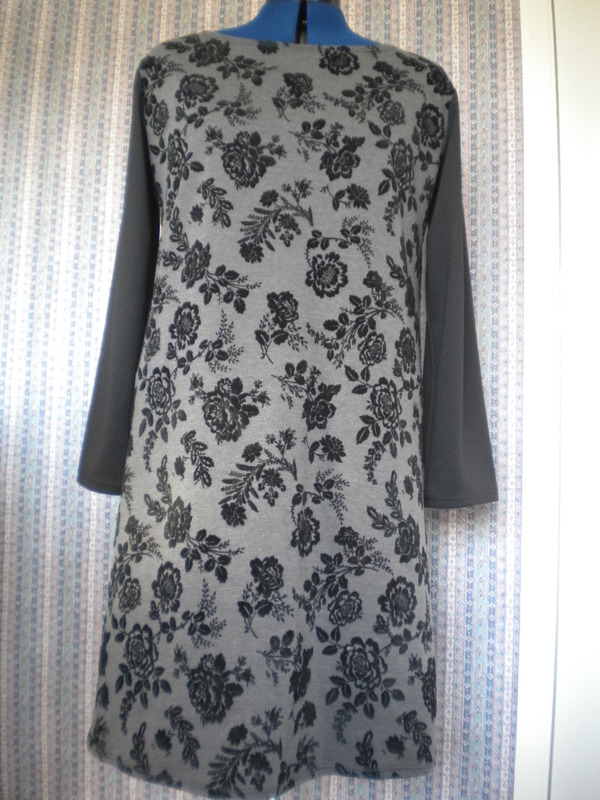 This entry was posted on August 26, 2014 by ann hebden in Coco, Dresses, Fashion, Sewing and tagged Coco, Dress, Fashion, Sewing, sewing course, Tilly and the Buttons, Tilly Coco..